Here is my favorite photo from last week. 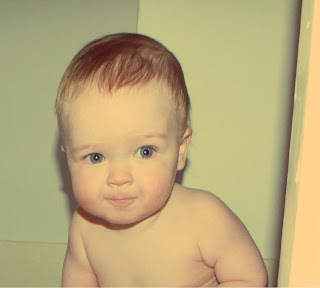 This is the little man just after his bath. He always tries to crawl away from me when I'm trying to get him dressed. He goes so fast and then turns around to peek around the corner and see if I'm coming after him! I've been getting into photography lately. Apps like instagram have made me get into it more and the little man's Dad has been really encouraging me too, telling me I have an eye for it so I've decided to get a camera and see how I get on. 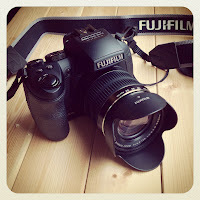 I've bought a Fujifim Finepix HS30 EXR bridge camera and so far I'm loving it. Its easy to use, feels and looks good and the settings seem to allow a novice like me to get some lovely snaps. I've used pixlr to edit the photo above and add effects. I love the slightly vintage look to this one. Everyone always says these days go too fast so I think that capturing the memories any way I can is really valuable and I know I will treasure these memories forever. I think the main thing is to snap away enjoy it and not worry about what you are doing too much. I'm looking forward to learning, getting better and having fun with my little man. Aww he is so gorgeous, really lovely photograph!